Diva is our social butterfly. She has an awesome, outgoing personality and absolutely demands to be the center of attention. At the young age of 3 months, Diva won Reserve Best Puppy in Show - her first weekend showing! She is pictured with her Dam, Liberty, who went Reserve Best in Multi-Breed Show that same day! Diva went on to earn her UKC Championship by the time she turn 7 months old, is currently on her way to her UKC Grand Championship and has earned AKC show points. From a very young age, Diva has excelled as a hunting dog. 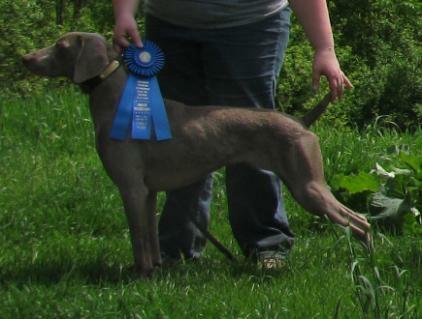 In her first AKC Field Trial, Diva beat out all breeds to obtain her first point. She is an awesome little bird dog and with medium range and a very busy hunting style. 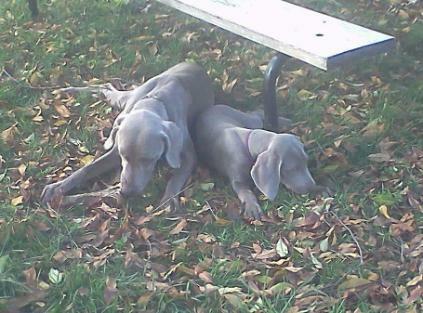 She has since easily and enthusiastically earned her Novice Shooting Dog and Novice Retrieving Dog Ratings. She has only been entered in one Junior Hunt test and passed with flying colors. Diva is currently training for higher levels of field competition while attending the occasional show. She is an awesome little dog with personality to burn and shows much promise for following in her Dam Liberty's footsteps by becoming a versatile, biddable hunter and companion.